Please use the links at the bottom of each page to follow the story in chronological order. I was also prompted to write this article by the knowledge that the main protagonist of the story, Heavenlyhogs, is still trying to sell hedgehogs and other exotic pets to an unsuspecting public. I sincerely hope that people who are thinking about buying any exotic from Heavenlyhogs, Pre-historic Pets or Michelle Fountain aka Viljoen under whatever name she may call her company, read this article before they make any purchases from her. 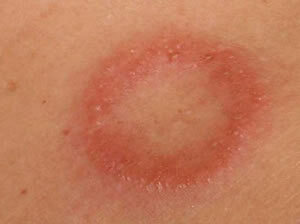 Ringworm : Ringworm is a common fungal infection of the skin. The name is a misnomer as the disease is not caused by a worm. Ringworm can be transmitted by infected people or pets or by towels, hairbrushes, or other objects contaminated by them. 8 Comments on "The Ringworm Story – Introduction"
Yes it looks like it’s being picked up by other pet blogs. I’ve been contacted by a couple of people who want to post about it on their blogs. The story is about to get published on Ezinearticles.com as part of a wider article I’ve done about exotic diseases and exotic pets. That should generate more awareness. she is still posting under that name on rfuk which i find quite amazing considering how often she changes her identity!! As a matter of fact i will still be using the name heavenlyhogs to sell hedgies.Why on earth would i want to change it? Despite what has been written(assumed ect)i’m sure people are capable of making their own minds up.There are a number of contradictions in your own writings also. For example if defra did not agree to not only not take any action but to allow the quarantine to be carried out at home then why have i not been prosecuted,and also why haven’t the hedgehogs been euthanised? That’s just a couple of things i can point out,not to mention the exaggeration of the time frame which is 3mts of non received refunds which has turned into 6mts and the hoglets are only JUST 6 mts old since yesterday?Ringworm was not confirmed until near christmas and refunds offered to ian and julie were declined for several weeks. Seems to me that people will base their conclusions on “EDVIDENCE” which there doesn’t seem to be ANY of to indicate or warrant the labels given. I admit refunds have not been sent as yet and i have given reasons for this,in chaz’s case NO vet report was ever received and in ian and julies case they have NEVER made contact to request it in private,only by way of public defamation,insults,jibes and general piss taking,yes buying a hedgehog from me entitled them to a refund if they were not satisfied and not the above.But they surely will receive it in due course and that will be at such a time i have dealt with issues concerning my rats. I have seen MANY accusations ect of lies,dishonesty ect but NO evidence. Thank you to all those who have contacted me with support. It’s unfortunate that when someone upsets those who “think” they are higher up and in control of the entire hedgehog population and community that they abuse their position to belittle others. Correction:hoglets are only in their new homes 6mts. No need for me to pop back again at any point i will use my site to address issue in future. Nothing on your site about this story Michelle. Only about the fact you are yards from the beach……. I was looking forward to reading your version of the events. Any idea when you’ll be paying Ian and Julie yet? My name is Trice and I’m 11 yrs old and I was wondering what would be better, to buy a hedgehog from a pet store or a breeder? If a breeder, what do you think would be a good choice to buy from? Are most hedgehogs in the US contaminated with ringworms? I really like hedgehogs and I would like to keep one as a pet so I was wondering if you know what or whom it would be a good idea to buy a hedgie from. Also beware of cats!!!! I bought a show quality persian with no papers, it had some flaky skin, but didn’t know enough to be aware of what it was.Took it in for shots and vet chk the next week and it had ringworm, bathed twice a wk as I was told, bleached all the furniture and steamcleaned, got 60+ ringworms on me, and all my friends and boyfriend also got them. The vet didn’t bother to tell me to confine the cat, when I went back they gave her the shot and cleared up, then they told me to confine it. Back to bleaching and steamcleaning washing and drycleaning. Ended up having to take meds, as did a few freinds and neighbors. It was 6 months of hell!!!! I later found out that long hair cats carry the gene that makes them susceptible to it. As do rabbits and apparently hedgehogs. If I were buying either, It would go under a woods lamp before final payment!!! Article Directory » Disease Ridden Hedgehogs?